Trent Jezwinski, director of healthcare construction for Welty/Boldt, took home the Bright Idea Award for recalling information from a training that took place over 6 years ago, which resulted in a potential 6-figure savings for the project. The seven teams working on Akron Children’s Hospital’s new building can get pretty tired at the end of a work week, especially when there are multiple companies working together for the first time and they’re challenged to change the status quo. So Bernita Beikmann, of HKS, and Nick Loughrin and Will Lichtig, of Welty/Boldt, put their heads together and came up with a way to energize the teams. Super Star with the Sticky Notes – The team or person who made the most strides in improving communication and collaboration. 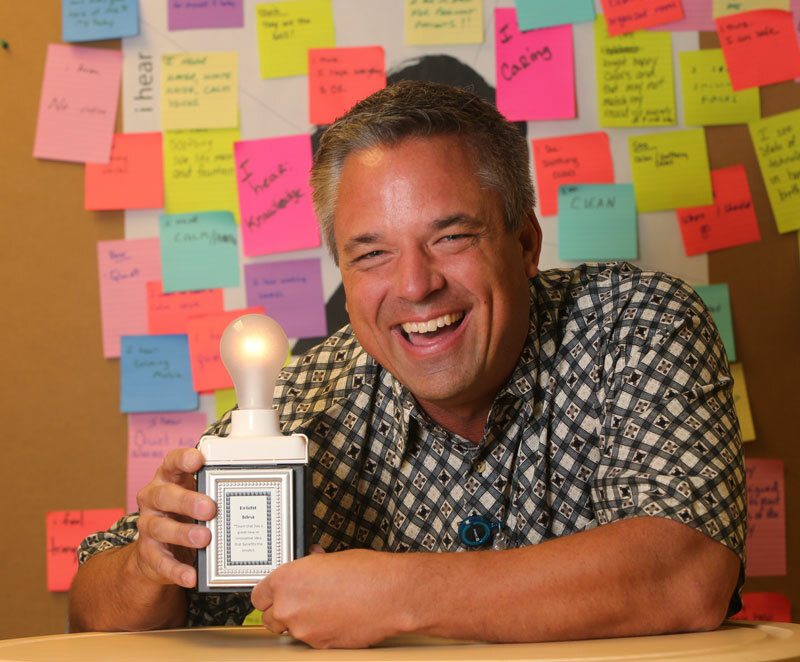 Bright Idea – Any person or team with a new, innovative idea to share. Purple Heart – A team or team member who overcame personal or professional struggles during the week or did something on behalf of another team. Super Spice – The team that brought the highest energy to the project. Raising the Bar – The team whose projected innovation savings surpassed their savings goal. Katniss Everdeen Award – The team that reached their target cost. Down the Rabbit Hole – The team member who helped prevent a task or conversation from going down the wrong path. Energizer Bunny – The team that reached its target cost, but still kept adding innovative ideas. 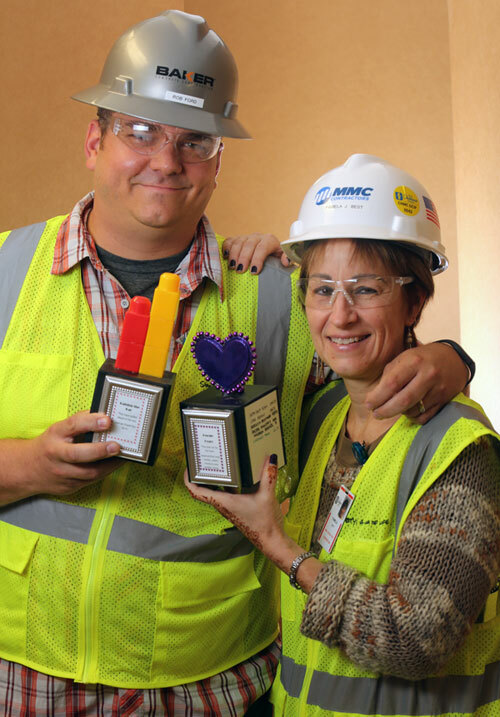 Rob Ford, estimator at Baker Concrete Construction, and Pam Best, director of pre-construction services at MMC Contractors, accepted the Purple Heart and Raising the Bar Awards on behalf of the team members working at the site to solve problems and ensure a safe environment. “Despite the silliness of their names, the intention of the awards is to motivate everyone to excel,” Beikmann said. The “trophies” can be as silly as their titles – a stuffed toy rabbit in a tumbler, a light bulb, a doll or a photo of the Spice Girls. Anyone can nominate a team or individual, and the winners are chosen by the group at the end of the week. “It was a little scary in the beginning, not knowing how receptive the teams would be to the idea, but the response has been overwhelmingly positive, with teams even competing for awards,” Beikmann said. The Mechanical, Electrical, Plumbing and Fire Protection Innovation Team even rapped out one of their presentations to win the Super Spice Award. The Purple Heart Award has been given out to a few team members who have gone above and beyond. “One recipient gave birth the day after a meeting, another worked until the day before her wedding day, and another member ended up in the ER during the week,” Beikmann said. And, of course, Akron Children’s received the Katniss Everdeen Award, named after the heroine of The Hunger Games, for its decision to include high-risk OB in the new building. “In keeping with the book’s story line, the winner of the award reached the target without being set on fire, starving to death, or being killed by another team member,” Beikmann laughed. For the construction workers at the site, a separate recognition program has been developed with hard hat stickers.